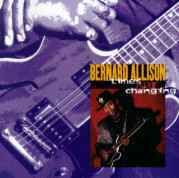 This is Bernard Allison's 2nd CD to be released in the United States, and it's an excellent introduction to this artist if you haven't heard him before. Production, musicianship, and the songs are all 1st class on this release. Of course most anything produced by Jim Gaines is top notch and there aren't any holes in this effort. The CD opens up with a funky rhythm guitar riff which resolves into a screaming guitar riff on "The River's Rising" and alternates between a funky shuffle and blues riffs. This song is as radio friendly as you can get. It's one of those songs that sneaks up on you and imbeds itself into your brain before you realize what's happening. My favorite song on the CD is "I Just Came Back to Say Goodbye" which is a rocker of a song with lots of guitar and heavy rhythm. It's style reminds me of the video by Robert Palmer "Addicted To Love" that was all over VH1 a few years back where the background band was all women who looked and dressed identical. "Love Is Free" is a slow song with bare musical backing for the most part with soulful guitar leads sparsely sprinkled through the song. Women who like to slow dance will love this one. "Change Your Way of Living" is an all out Chicago blues shuffle, complete with honky-tonk piano. "I've Been Down" is one of those down and dirty songs with lots of grinding guitar where the singer tells how terrible his life is going. An old formula...but it always pleases a crowd. Overall...bottom line...however you wish to say it...this is a fine CD and rates a solid four stars out of five. Lot's of great guitar, rockin songs, excellent production, great diversity of songs styles, and definitely a worthwhile purchase. I'm looking forward to seeing him live when he tours through my area in November. This review is copyright © 2000 by Robert Murphy, and Blues On Stage, all rights reserved. Copy, duplication or download prohibited without written permission. For permission to use this review please send an E-mail to Ray Stiles.